Now a restauranteur can have a full featured open POS system at an economical price with no moving parts in the terminal. Unlike proprietary terminals that lock the client into high repair prices and often times poor service. Win-EZ is completely open architecture. The secret is the Win-EZ graphical user interface which brings to life everything needed in a POS system without requiring the overhead of old fashioned PC’s. Even Win-EZ remote printing is state of the art, with built in redundancy and automatic print job rerouting. All printers plug directly into the network switch. The Win-EZ appliance-based POS system is an innovative, rock solid, and easy to use touch screen POS system. Win-EZ is so intuitive and low maintenance that if you can read, you can use it. 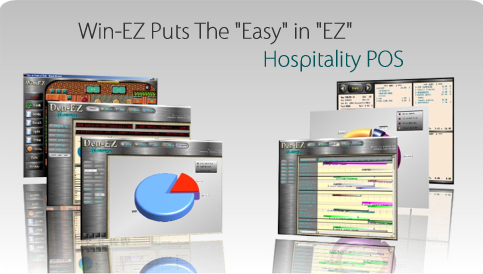 Every part of Win-EZ is designed to be easy to use and to make you more money. Non achololic beverages can be forced to match the number of guests. This means that all beverages will get charged on the customer's check. Catching 10-15 beverages a day adds up to a huge dollar amount annually. Copyright © 2011 Hospitality Data Systems Inc.